An eye witness tells tragic stories. Indescribably moving first-hand stories of the amazing misery of the 10,000 wandering orphans of Serbia have been given me by Father Nikolai Velimirovich. "One day I was standingoutside the Town hall in Nish. A little girl was in the bread line, and when it came to her turn she asked for two loaves. "Oh, please give meone more," she cried. "I am not alone. We live six together." "I made them give her two loaves,and went with her. We walked for half an hour, and at last came to a field. But I saw no house. There was a little heap of straw, and in it six little children were playing." When they saw Yela coming their faces lit up, and they ran toward us with little shouts of joy. This was the only food they got each day. They lived in the straw, and Yela was their only protector!" "In Lazzaravitch I saw a boy holding a dog by a chain. He was crying, and a few 'soldiers were gathered around him." 'What is the matter, my little man?' I asked." "He was Marko Markovitch. When the enemy came his mother told him to flee, while she remained to look after the house. "I did not want to go," he told me. "I got my dog and we ran away. We walked for days and days, and we slept in the fields. Once it snowed. I have walked half over Serbia, 'and Iam now going back to look for mymother. We have stopped here for a rest." 'Yes, I am hungry. 'But give my dog something first.' "
"Kossera Petrovitchwas the mother of four. She fled from Resnik to Belgrade and tried to get a train to take them south, The cars were full, and there were 20,000 others waiting there. In the terrible struggle for trains Kossera stayed four days." Then one of the children strayed. Where? Who knows? It was lost! "On the fifth day she and the other three got aboard a train. After 50 miles the second child was crushed to death on the train. Two days later another child died. "Then I saw her with her one remaining child and no home. She said to me:" 'I will go home. What does it matter if I and this one are killed, too?'" "A father is fighting at the front The mother has died of typhus. The children are left without anybody. Kosta is a boy of 12, and his sister Vera is 9. They start off to find their father. After many days of wandering, by chance they meet him. 'Mother is dead. What shall we do with the house?' they ask. "The poor father, fighting for his country what answer could he make them?" "There are ten thousand children looking for their parents like this.They are known as the "wandering children" --Serbia's babes in the woods. Just a few of the 10,000 war orphans wandering around aimlessly about their country of Serbia in search of food and shelter. A WWI first-hand account of the plight of the Orphans in Serbia by St. Bishop Nikolai Velimirovich! Orphans were taken to Libertyville, IL. 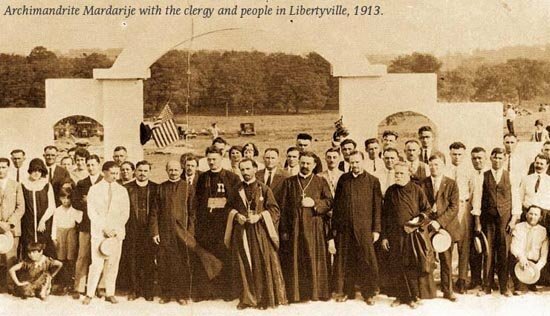 Here is St. Bishop Mardarije in 1913, before the Monastery was built.